What are the standard sizes of Garage Doors Direct residential garage doors? Standard sizes are whole width increments starting at 8' wide and going to 20' wide. Some door series have sizes smaller than that. Standard heights are 7' and 8' tall. Odd-heights and odd-widths are also available and vary by individual door series. 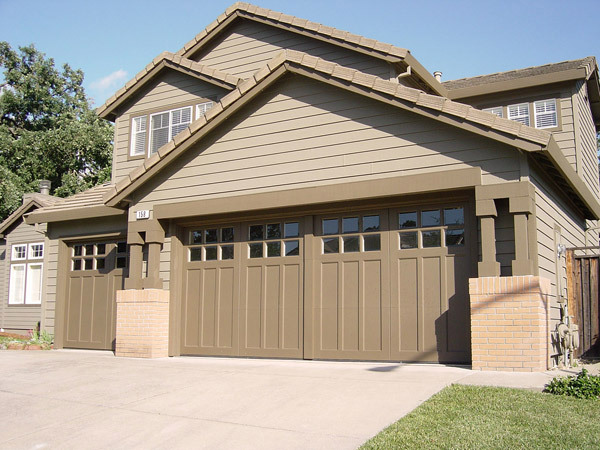 Garage Doors Direct steel garage doors for residential and commercial applications can be painted in the color of your choosing, with 100-percent acrylic latex paint. Some doors can also be powder coated, and we offer 197 powder coat colors to best complement the look of your home or your facility. Depending upon the damage involved to the garage door system, replacing only a section of your garage door is possible in some cases. For additional help, Garage Doors Direct expert representatives at 1-877-357-Door (3667) can answer your garage door questions, evaluate your situation and recommend the best course of action. What is R-value, and how does it benefit me? R-value is a standardized measurement of thermal efficiency. The higher the R-value, the greater the garage door’s insulating properties. Garage Doors Direct manufactures insulated garage doors for residential and commercial applications, with a broad range of R-values designed to meet your needs.. This is a common question when it comes to choosing a garage door. Garage Doors Direct offers many designs, with a number of options to further customize your garage door. For a contemporary look to set your home apart, our Contemporary Collection features garage doors that combine glass and aluminum for unparalleled visual style, strength and light infiltration. It’s a unique solution for your extraordinary home. To transform the look of your home, choose a beautiful, custom-crafted wood door. Fine woods and precision craftsmanship make the doors in our Carriage Collection architectural works of art. Browse 21 standard designs, available in semi-custom or custom styles. You can also design your own door to match your home’s architectural style. Optional decorative hardware adds the finishing touch. For the beauty of wood and the durability of steel, our Artistry Collection combines the classic look of a carriage-house door with the value of insulated steel. These doors come in your choice of 18 different designs (with or without windows) and six colors. Or they can be painted to match your home’s color scheme (frames, trim and overlays are white). Our Lodgewood Collection doors feature wood-grain embossments to enhance the appearance of your door. Choose standard-raised or woodgrain-textured flush panels in six different colors. 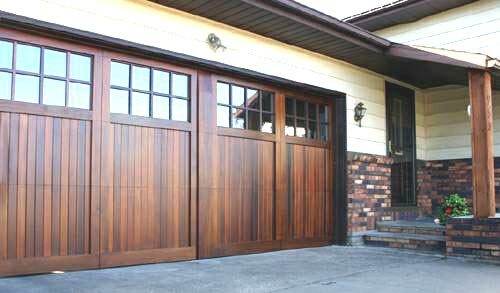 Our traditional steel garage doors Gold Series of simulated woodgrain embossments enhance the appearance of your door. Choose from classic, raised panels or contemporary, ranch panels (some models). All doors can be painted to match your home’s décor. What garage door works best in my climate? If your garage will be subjected to extreme temperatures, hot or cold, consider a well-insulated door to ensure your maximum comfort. The higher a door’s R-value, the greater its insulating properties. Insulated doors offer R-values up to 17.5. This is made possible by a continuous layer of foamed-in-place polyurethane insulation sandwiched between two layers of rust- and corrosion-resistant steel. These doors also feature between-section seals that provide added resistance to air infiltration, as well as bulb-type bottom seals that guard against wind and rain. If you live in a coastal region or area with special wind codes and regulations, Garage Doors Direct also offers a variety of heavy-duty, wind-load doors built to withstand hurricane-force pressures. We customize our doors to meet or exceed any state or county wind-load code. Ask one of our expert representatives at 1-877-357-Door (3667) for more details about choosing a garage door in your area. Garage Doors Direct takes great pride in manufacturing residential products that work every day and last for life. We stand behind our work. To prove it, many of our residential garage doors automatically come with a warranty that protects against rust-through for as long as you own your home. And to demonstrate our commitment to customer satisfaction, high standards and quality workmanship, all Garage Doors Direct garage doors include a one-year, non-transferable, limited warranty (see warranty for full details). How do I choose a residential garage door opener that completes my door system? Garage Doors Direct features a comprehensive list of residential garage door openers and opener accessories that work with your garage door, giving you a complete system designed for practical applications and durable, daily use. After choosing a garage door, please see our list of residential garage door openers and accessories that work best with the door you select. Screw Drive—powerful, fast and quiet. Maximum power for heavy doors. Belt Drive—quiet and smooth performance. Ideal for garages adjacent to living areas. Chain Drive—rugged and reliable. Suitable for most garage doors. What is DC Motor Technology that is featured in some of Garage Doors Direct openers? DC motor operates with variable speed for soft start and stop, smooth operation and less wear and tear on your garage door. My opener came with a Series I wall button. Can I install and use a Series II wall console with this opener? No, you need a Series II wall console to install with a Series II opener. My opener has a Series II wall console. Can I use more than one wall console with my opener? No, you can install only one Series II wall console per opener; however, you are able to use a Series I wall button as second device. e) Lubricate steel rollers. DO NOT lubricate nylon rollers. 2) Check for loose or bent hinges. b) Straighten or replace bent hinges. Door must be locked and in the down position. 4) Check the door and track supports for loose or missing bolts, screws, etc. Be careful not to over tighten. 5) Check the extension cables. Are they running properly in the sheaves? Check for wear of the cable at the bottom bracket button. 6) Check for bent track. If bent, call an authorized professional dealer. 7) Extension spring hardware, including springs, cables, sheaves, sheave forks, bottom brackets, and containment cables, should be adjusted or repaired only when the spring tension is released (the door must be open). These repairs should be made by a qualified door technician or a mechanically experienced person with proper tools and instructions. 8) If your door has torsion springs, the spring assembly and wood anchor pad should only be adjusted or repaired by a professional door technician.